Collecting dusty ancient books might not sound like a fun activity, nor a fun evocative theme for a board game. But, I promise you that Ex Libris is anything but boring. Prepare to collect Fantastical Fictions, Monster Manuals and many more books to become the Grand Librarian. What is Ex Libris like? 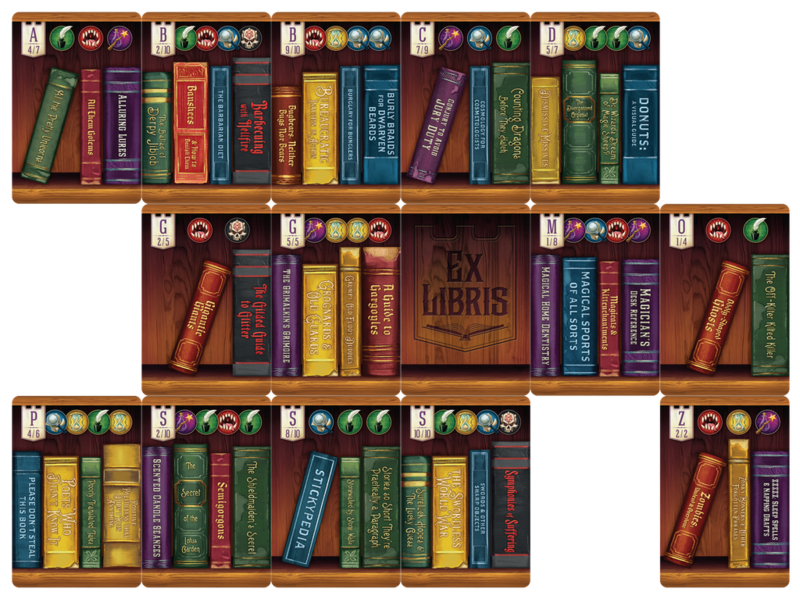 In Ex Libris you compete against other players to become the Grand Librarian. You do this in a wonderful fantasy setting that’s beautifully illustrated. The game revolves around having the best collection of books. The books are divided into 6 different categories(Corrupted Codices, Fantastical Fictions, Historic Volumes, Monster Manuals, Reference Texts and Spells & Potions). At the start of each game one of these categories will be randomly determined to be the Prominent Works (meaning that you’ll get extra points for each of these you have), one category will be the Banned Books (meaning you lose points for each of these you have), and finally there is the Library Focus that each player well be secretly assigned (having books of that type will also score you bonus points). As I mentioned in the overview this is a worker placement game, but it’s not like any worker placement you’ve ever played before. The spots for your workers (called locations) will fluctuate and change over the course of the game. Each round several new locations are added (equal to the number of players) and at the end of a round all, but 1 of these are removed. So during the game more and more locations will become available, but many of them you will only have access to for a single round. All of these locations (17 in total) give players various ways of acquiring bookshelf-cards. Some of them allow you to take them into your hand and others allow you to put the cards on the table and expand your growing collection. This is where the key aspect of the game comes into play. Building the perfect (or as close to perfect collection as you can manage) is what the game is all about. Not only will you have to juggle the various negative and positive points the different categories of books will award or penalize you, but you also have to build you bookshelf so that it’s sorted alphabetically from left to right, top to bottom. Sorting the books this way makes the order in which you acquire cards very import. You really have to plan ahead and think carefully about where you put your cards. To get the most points out of your collection of books, you even have to take Shelf Stability into account, so you want to build as square and stable, a collection of crazy fantasy books, as you can. The game ends when one player has reached a certain threshold of cards in their collection. You then tally up points based on Prominent Works, Banned Books, Library Focus, Shelf Stability and even Categorical Variety (that encourages you to have as diverse a collection as possible). These points will all be noted on the super fancy (and handy) dry erase Official Library Inspection Form B-7c scoreboard. The player with the most points will be named Grand Librarian and gains the bragging rights of having the most amazing book collection. Ex Libris does so many things, that I love, right: It has a unique theme with mechanisms that support that theme very well, it has great art and a fun colourful setting, it even has awesome components (chief among them being the lovely special workers). The big questions is of course: Does the sum all of these parts come together to make a great game? I can tell you now, they do not… They all come together to make an amazing game! Each game will feel very different because of the way the locations (that has the spots for your workers) come out in a different order each time you play. Also the many different “special workers” will make sure that you’ll never get bored playing this delightful game. What I enjoy most about the game however, is the collecting of the bookshelves and the 2D puzzle it creates trying to organize them in the best way possible. This just makes so much thematic sense and is at the very core of the game. Everything else revolves around (and supports) this, and I simply think this is brilliant. While the core game itself is brilliant, the attention to detail makes it even more so. There are 152 unique cards that holds 510 unique books, with unique tiles. A lot of these names are puns or geeky references and it really does add to the setting and impression of the game. Add to that the 12 different Library Tiles that will give each player a unique power and a special worker. All of these special workers have custom meeples (one of them is an awesome green gelatinous cube designed to have an air-bubble inside). Humor plays a big part of Ex Libris. The names of the books, the art style, the different Library Tiles, the rule book. They all ooze humor and whimsicality, and it fits in perfectly with this game. Ex Libris get’s the honour of being the first game to be awarded with Tabletop Together’s Scroll of Awesome, a special award only given out to the best of the best games (at least the games we think are the best of the best). 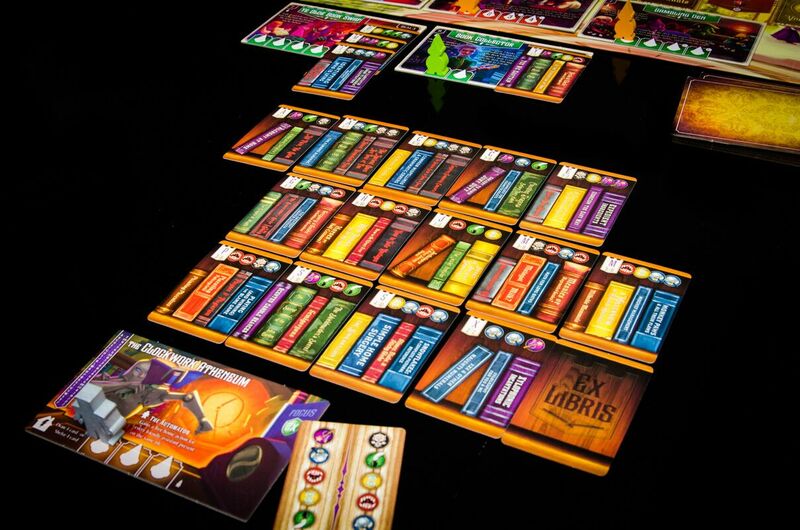 Ex Libris has a pretty simple set of rules that are easy to understand and get into. The rulebook is well written. If you start out not using the “special workers” it’s very easy game to get into. Photos provided by renegade games.